More than 135,000 cats and dogs enter our state’s animal shelters every year and almost half of them are euthanized simply for lack of adoptive homes. Often, New Mexico’s pet overpopulation problem is made worse because spay and neuter services are either unaffordable or inaccessible, or both. In 2007 the state legislature and Governor enacted a law that created the Animal Sheltering Board (ASB) within New Mexico’s Regulation and Licensing Department. The ASB’s mission is to ensure a humane death for every shelter animal requiring euthanasia, define standards for shelter operations and facilities, and develop spay/neuter initiatives. As of early 2015, the Board has issued licenses for 281 euthanasia technicians, agencies and instructors. It has produced an important study of development and funding options for a spay/neuter initiative to aid low-income households in New Mexico, and published a statewide Recommended Minimum Standards for Animal Shelters in New Mexico. And it has distributed approximately $100,000 from the statewide spay/neuter fund to public shelters with the highest intake and euthanasia rates in the state. When domestic violence occurs in a home, animals are often victims, too. Batterers frequently threaten, injure or kill companion animals to intimidate, control or punish family members. Consequently, as studies show, many domestic violence victims delay leaving an abusive environment because they don’t want to leave their beloved animals in harm’s way. Their concern is very real—most domestic violence shelters in New Mexico do not allow companion animals. Animal Protection of New Mexico’s CARE program provides safe, temporary housing for animals of domestic violence survivors. CARE saves lives—in partnership with the New Mexico Coalition Against Domestic Violence—and thanks to $50,000 in recurring state funding secured by 2015 Milagro Award winner Senator Nancy Rodriguez—but our state still needs more help. On a tether constantly, a dog is deprived of social contact with other dogs and humans. Sensory deprivation becomes the norm, and boredom, frustration, anxiety, agitation, and aggression follow in rapid succession. Often, these dogs are also found neglected: starving and underweight, ravaged by fleas and parasites, or with collars embedded in their necks. When confronted with a perceived threat, a chained dog, unable to flee, often feels forced to fight and attacks any animals or people who wanders into his or her territory—and children are the most common victims of dog attacks. 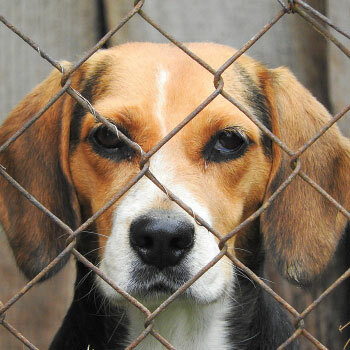 Without exception, people and organizations widely regarded as experts on the humane treatment of animals and animal behavior agree that a solitary life on the end of a chain is a cruel sentence for dogs. Coupled with proper enforcement of the relevant state laws, laws that prohibit or limit tethering have been shown to reduce dog attacks, dog fighting, and cruelty complaints.